LPOD has previously described different manifestations of volcanism in Atlas (right) and Hecules (left). This image reminds that there are additional stories to tell here. First, is Atlas E, the subdued crater to the north that is partially overlapped by Atlas. E looks old, much older than Atlas, but was it already old when Atlas formed or was instantly aged? Certainly, Atlas dumped more material on the southern part of E's floor than elsewhere, but the entire crater looks worn. A clue comes from Atlas and Hercules. Hercules is younger than Atlas - the evidence is its fresher morphology and the observation by US Geological Survey mappers that Atlas is covered by small secondaries from Hercules. But the ejecta from Hercules does no perceptible harm to Atlas. The distance between the centers of Hercules and Atlas is about the same as between Atlas and E, so we can infer that E was already old. A second treat to observe here is the small, bright and unnamed ray crater east of Atlas. Notice that it's rays have a zone of avoidance to the bottom right. That was the direction it's impacting projectile came from, making an oblique impact. 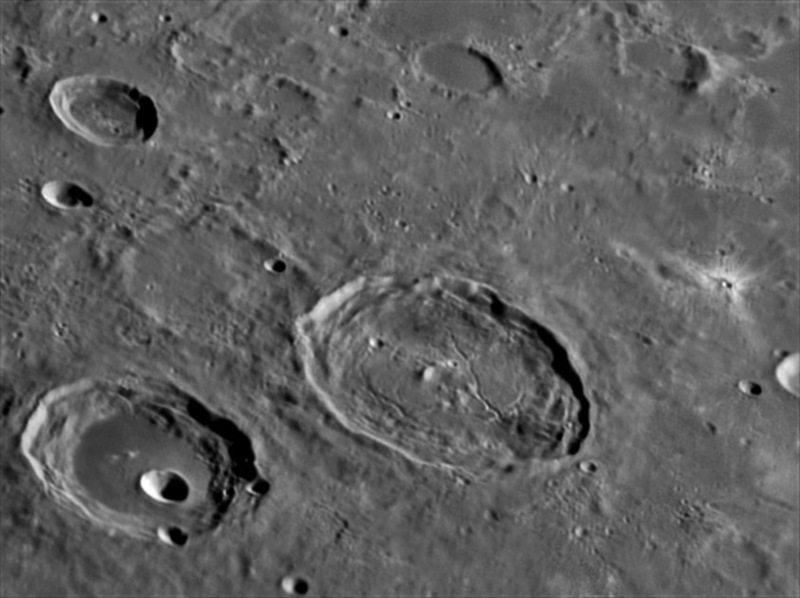 If rays did not fade with time, the Moon would be criss-crossed by bright streamers and we would have a harder time determining relative age, but we could tell for each crater if it resulted from an oblique impact. May 30, 2009. (0:19 UT on 5/31/09) C-14, DMK21AU04, Baader IR pass filter. This page was last modified on 18 August 2018, at 20:27. This page has been accessed 1,480 times.